A discussion of the budding generation of young musicians in Afghanistan. Under Taliban rule, the performance of music was banned, and the guitar is now playing a role in the rebuilding of a musical culture, and a society moving forward. In November 2014, Davin appeared as a featured musical guest on the Late Show with David Letterman alongside soprano Jessye Norman. He has performed at venues across the world, including Carnegie Hall, Alice Tully Hall, the Metropolitan Museum of Art (on historic instruments from the museum’s collection), New York Philharmonic Ensembles, the Alhambra Palace in Granada, Spain, the Paris Conservatoire, and venues throughout the United States. His collaborators include Grammy Award-winning soprano Estelí Gomez, conductor and pianist Philippe Entremont, and Pulitzer Prize winning composer Caroline Shaw. Since 2012, he has taught and performed at the Aspen Music Festival as the teaching assistant to Sharon Isbin, and has three times been a guest teacher at the Afghanistan National Institute of Music in Kabul, Afghanistan. Davin’s debut solo recording, The Infinite Fabric of Dreams has been praised as “some of the finest interpretations I’ve heard … achingly beautiful … a thoughtful, perceptive interpretation, filled with details often missed” (American Record Guide) and “a first-rate disc … Davin knows the pieces deeply and delivers virtuosic and exciting performances … state of the art” (Soundboard). Davin is a catalyst for the creation and performance of contemporary music. He has performed with the new music ensembles Contemporaneous, Axiom, New Juilliard Ensemble, and Mimesis Ensemble, and is the founder of The Millennial Music Festival, which has promoted new commissions and intriguing programs featuring New York’s finest young musicians. Colin Davin holds a Master of Music degree from the Juilliard School, where he studied with Sharon Isbin; a Bachelor of Music from the University of Southern California with William Kanengiser; and preparatory studies at the Cleveland Institute of Music with Jason Vieaux. 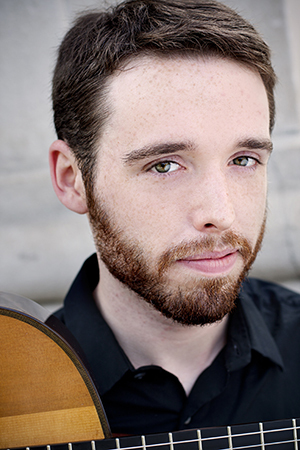 He holds numerous top prizes in international competitions, including the Guitar Foundation of American International Solo Competition. In the fall of 2015, he joins the conservatory faculty of the Cleveland Institute of Music.